I first started drinking coffee in graduate school. Long before Starbucks, there was a small coffee bar on the UCLA campus, a wood-paneled enclave for hipsters with the requisite chalkboard displaying the day’s brews, a steady stream of foo-foo music wafting in the background mixing nicely with the deep intoxicating aroma of freshly brewed coffee. The bland instant stuff consumed by my suburban parents replaced once and forever by rich, full-bodied, complex flavors from exotic lands like Sumatra, Java, Kenya, and Guatemala. I was a teaching associate and did all of my outside classroom work there, armed with nothing but a highlighter, a cup of coffee, and a pocketful of change. It will come as no surprise to people who know me that I soon became a coffee snob, storing beans in an airtight glass container bought expressly for that purpose, grinding them each morning to a perfect consistency, and brewing them in the latest “best in class” contraption written up in whatever hoity-toity magazine I happened to be reading at the time. Coffee used to have a bad name—blamed for jitteriness, high blood pressure, ulcers, and more, but as coffee research has advanced it turns out that the stuff isn’t bad for you when consumed in moderation. In fact, the preponderance of data suggests just the opposite: Coffee, consumed at a dose of 2-4 eight-ounce cups per day, is almost certainly good for you. The key ingredient, of course, is caffeine, but there are plenty of other biologically active compounds in a cup-o’-Joe. So how much caffeine is in coffee anyway? A standard 8-ounce cup of drip coffee has roughly 140 mg of caffeine. 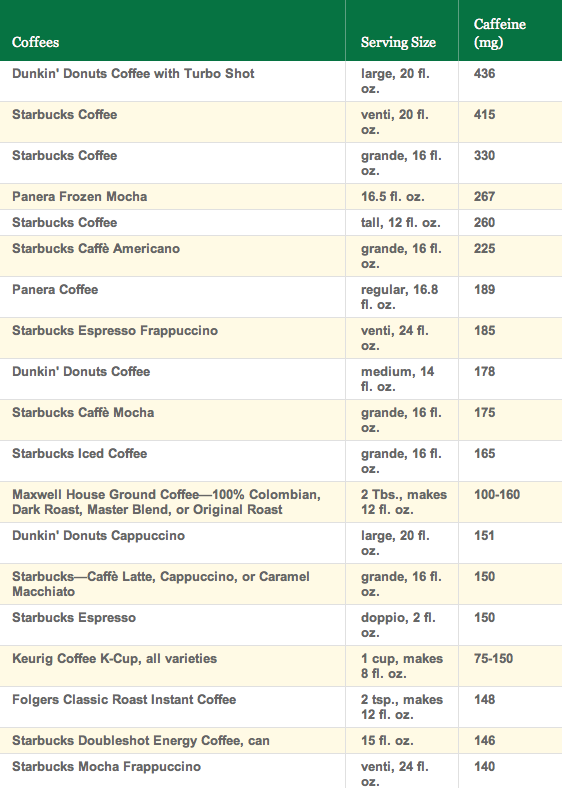 Compare that to the 330 mg in a 16-ounce Starbucks Grande. 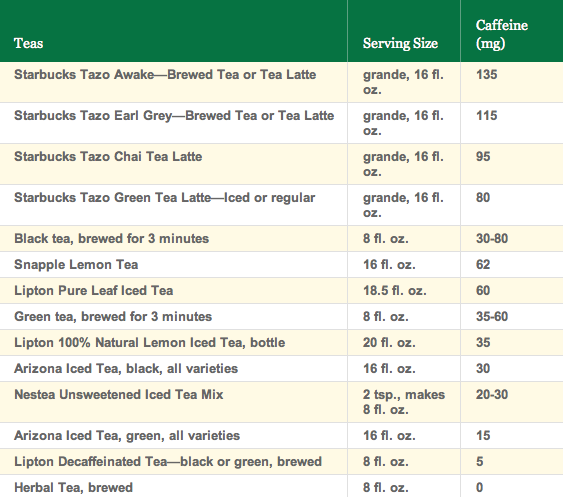 One of the reasons people like Starbucks so much is because they jack up the caffeine content of their coffees. While espresso does possess more caffeine on an ounce-to-ounce basis than regular coffee, a typical 1-ounce shot contains just 65 mg. 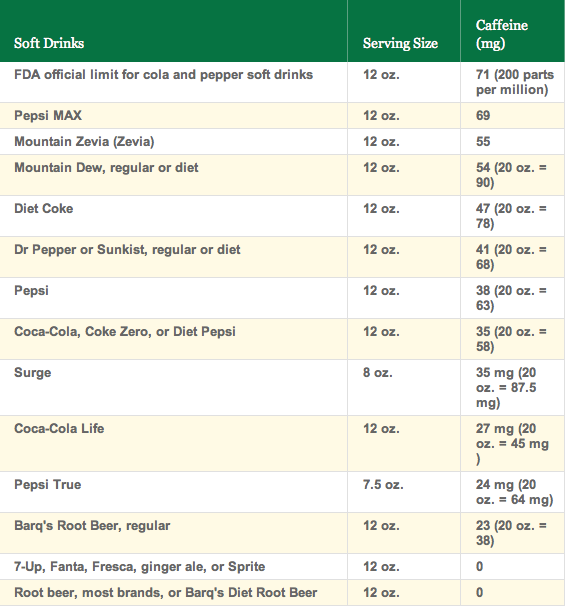 Most teas contain between 30-60 mg per cup, while soft drinks come in at similar levels for a 12-ounce soda. Even Mountain Dew and Pepsi Max, known for their “high” caffeine content, have just 54 and 69 mg per soda, respectively—nowhere near the amount contained in a similar sized serving of coffee. Smaller amounts of caffeine can also be found in chocolate and ice cream/frozen yogurt products containing chocolate and coffee ingredients. The term “energy drink” is really a misnomer—energy comes from glucose, not caffeine. Most of these products have modest amounts of sugar and middling amounts of caffeine, but they’re mostly just about the hype. 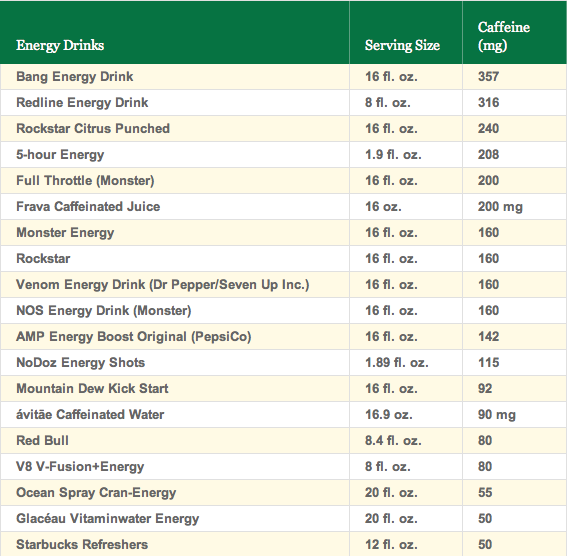 Even the highest caffeine-containing energy drink (Bang) has less caffeine on an ounce-to-ounce basis than a cup of Starbucks. As for the added B-vitamins and other “alertness enhancers,” forget about them—they provide no energy and enhance only the manufacturer’s pocketbook. “The amounts of guarana, taurine, and ginseng found in popular energy drinks are far below the amounts expected to deliver either therapeutic benefits or adverse events,” concluded a 2008 pharmacy review. 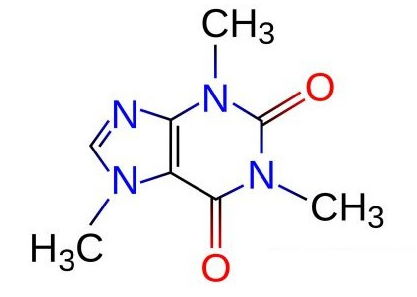 For the science geeks, caffeine belongs to the larger class of compounds known as methylxanthines and blocks phosphodiesterase, the enzyme responsible for the breakdown of cyclic-AMP. Receptors for cyclic-AMP reside throughout the body and blocking this key enzyme is the primary way caffeine exerts its physiologic effects. Caffeine also directly blocks adenosine receptors, potentiates the effects of catecholamines like adrenaline, and inhibits the receptors responsible for sedation in the brain. These biochemical properties result in the host of physiologic effects typically associated with caffeine. It increases heart rate and acts as a vasoconstrictor causing a non-clinically significant increase in blood pressure. Caffeine is a CNS stimulant, resulting in enhanced alertness, concentration, and arousal. In the GI tract, it stimulates gastric secretion and enhances GI motility. At the level of the kidney, caffeine suppresses vasopressin resulting in diuresis (i.e. it makes you pee). Of course, there are also a few downsides. Caffeine contributes to osteoporosis by promoting calcium mobilization from bone. It also fulfills criteria for a drug of addiction; caffeine’s use over time is associated with tolerance, withdrawal headaches are well described, and many people display aspects of psychological dependence. At doses greater than 500 mg, caffeine induces tremor, anxiety, and insomnia. Overdoses of 10 grams or more may result in seizures, cardiac dysrhythmia, even death. A Norwegian teen made headlines in 2014 after lapsing into a coma and developing acute kidney failure following the deliberate consumption of 4 liters of an energy drink during a 16-hour marathon session of Call Of Duty. Ironically, the only “call to duty” in this case went to the physician specialists called in to save the kid’s life. Stupid is as stupid does. For most of us, however, the amount of caffeine in a cup of coffee represents a harmless pleasure that enhances mood and alertness. But coffee isn’t just about the caffeine. The drink contains a host of other beneficial compounds, which is why coffee is the healthiest way to get your caffeine fix. In fact, in their 2015 published recommendations, the Dietary Guidelines Advisory Committee had this to say about coffee: “Moderate consumption (three to five 8-ounce cups per day or providing up to 400 mg per day of caffeine) can be incorporated into healthy eating patterns.” The fact that “coffee” was mentioned more than 200 times in their report indicates a growing awareness of the drink’s benefits. While the committee didn’t go so far as to actually recommend coffee drinking, it probably should have. Coffee contains caffeic acid, flavonoids and other polyphenol antioxidants, as well as the diterpenes cafestrol and kahweal, all of which have been shown to decrease carcinogenesis in lab and epidemiologic studies. There is now a growing body of evidence linking coffee consumption to a decreased risk for the following types of cancer: breast, colorectal, liver, endometrial, prostate, basal cell, melanoma, and head & neck cancers. The effect appears greatest for breast and liver cancers where consuming 5 cups of coffee or more per day has been linked to a near 50% reduction relative to people drinking less than 2 cups per day. The evidence linking coffee to the prevention of type 2-diabetes is even stronger. A meta-analysis reviewing the combined observational data for more than a million patients found a 30% reduction in the incidence of type 2-diabetes in those drinking more than 4 cups of coffee per day. Even after controlling for body mass index the benefit persisted, so it’s not just that coffee drinkers are hyped up and eat less. Decaf worked nearly as well as the caffeinated stuff, so it’s something in the coffee besides caffeine that does the trick. Coffee is linked to a markedly lower incidence of Parkinson’s, and appears to offer at least equal or better neuroprotection against dementia than expensive pharmaceutical agents like Namenda, Aricept, and Exelon. Coffee works equally well as SSRI-drugs to prevent depression (but not as well as exercise, so maybe have a cup of java before hitting the road for a run). Need more? Coffee offers protection against gout, helps “dry eye” syndrome, and may even reduce bacterial MRSA infections (coffee drinkers are half as likely as non-coffee drinkers to harbor the bug in their noses). There’s also the social appeal. Few things are better than getting together with friends at a coffee bar before going for a group ride, skate, or run. Coffee not only provides the rallying point but also enhances subsequent athletic performance when ingested at doses of 3-5 mg/kg (equivalent to a Starbucks Grande for an average weight individual). Whether it will help you do better on a calculus test has yet to be formally tested, but there is strong data to suggest that drinking coffee will help you live longer. A meta-analysis review of nearly a million patients over a mean duration of 14 years of follow-up found an inverse linear relationship between coffee consumption and mortality. In men drinking between 2-4 cups per day, coffee was associated with a 19% lower age-adjusted mortality, while in women the benefit was 16%, a trend that leveled off at 5 cups or more per day. And while association does not prove causation, it’s worth noting that this is a far greater mortality benefit than for all cancer screening combined. So go ahead and have that cup of coffee—it might just save your life. A. Clauson et al., “Safety Issues Associated With Commercially Available Energy Drinks,” J Am Pharm Assoc 2008; 48 (3): e55-63. Bill Gurley et al., “Multi-Ingredient, Caffeine-Containing Dietary Supplements: History, Safety, and Efficacy,” Clin Ther 2015; 37 (2): 275-301. Andre Nkondjock, “Coffee Consumption and the Risk of Cancer: A Review,” Cancer Letters 2009; 277: 121-25. Xiubo Jiang et al., “Coffee and Caffeine intake and Incidence of Type 2-Diabettes Mellitus: A Meta-Analysis of Prospective Studies,” Eur J Nutr 2014; 53: 25-38. Webster Ross et al., “Association of Coffee and Caffeine Intake With the Risk of Parkinson Disease,” JAMA 2000; 283 (20): 2674-79. Adrian Hodgson et al., “The Metabolic and Performance Effects of Caffeine Compared to Coffee during Endurance Exercise,” PLOS One 2013; 8 (4): e59561. Terry Graham, “Caffeine and Exercise: Metabolism, Endurance, and Performance,” Sports Med 2001; 31 (11): 785-807. Youjin Je and Edward Giovannuci, “Coffee Consumption and Total Mortality: A Meta-Analysis of Twenty Prospective Cohort Studies,” Brit J Nutr 2014; 111: 1162-73. This entry was posted in Uncategorized and tagged caffeine, coffee. Bookmark the permalink. Thanks for the info Dr. Bob. With my current inflammatory arthritis issue, your advice on reducing coffee intake or increasing? I usually have 2 to 3 cups/day. I see no problem with 2-3 cups a day, only benefit and smiles.